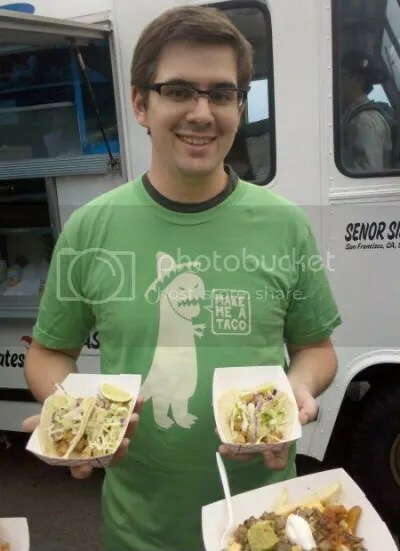 The Sandwich Dinosaur t-shirt from SEIBEI is fun to wear when you’re headed to a sandwich shop, but what about the days when you’re seriously craving Mexican food, specifically tacos? SEIBEI has the answer! Back by popular demand, “Taco Dinosaur!” features the infamous bossy dino wearing a sombrero and demanding a scrumptious taco. Although the first colorway for this design was red, it has been brought back in a green “Cilantro and Onions” variant. I’m thinking of getting this shirt right away and wearing it every time I head out to get tacos. Sounds like an awesome idea, don’t you think? 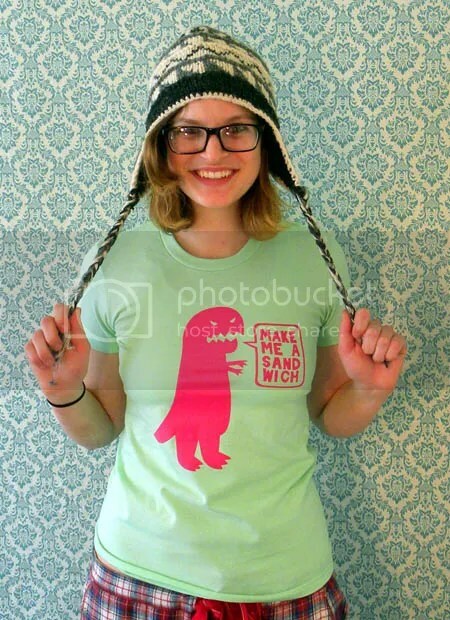 You can purchase “Taco Dinosaur!” at SEIBEI for $22. Be sure to use the coupon code “LTT” to take 10% off your order! You know you love mystery tees. I know you love mystery tees. 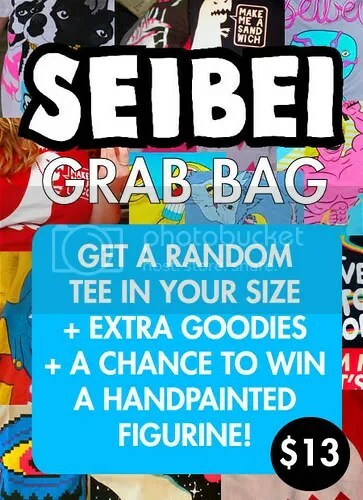 For $13, you can get a grab bag from SEIBEI that includes a t-shirt (you have the option of a current or discontinued shirt), an extra goody (e.g., a tote bag, buttons, another t-shirt), and a chance to win a hand-painted SEIBEI figurine that hasn’t even been released yet! I personally don’t think that you can be disappointed with anything that you end up receiving. And if that wasn’t enough, you can use the code “LTT” to save 10%! So what are you waiting for? Get your SEIBEI grab bag today! Alex Solis does it again with a new print called “Operation Extinction.” Available at Teefury, this tee shows a new scenario for how the dinosaurs went extinct. Climate change? No. Volcanism? Nah. Huge meteors? No way! You can kiss those culprits goodbye. Clearly, extraterrestrial beings made it all happen. 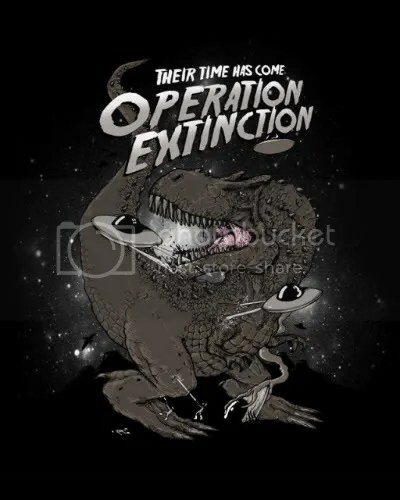 You can purchase “Operation Extinction” at Teefury for $9. Don’t wait around too long though, because just like the dinosaur, this tee will go extinct at midnight! I knew it! Normal distributions don’t really exist at all. They’re just a big lie to hide the fact that these graphs are all 2-dimensional sauropods. Why must you cover up the fact that there are dinosaurs in bell curves, professors? Now that we know how they’re actually supposed to look, I say we liven up stats class with these true representations. If they look this awesome, they must be accurate, right? 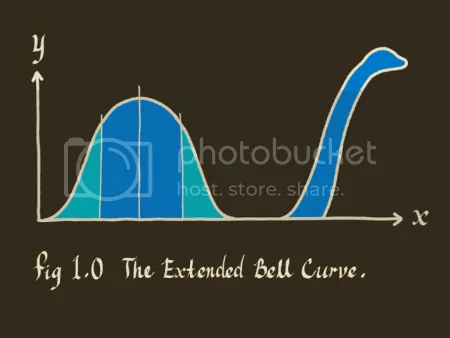 If you like what you see, then pick up “The Extended Bell Curve” by Tang Yau Hoong for $10 at Shirt.Woot before midnight Central Time! This is a shirt for the fat kid in all of us (or, like me, the fat kid that I am every day). Don’t hate. Show your love for the wonderful fat person you are, the wonderful fat person you are inside, or those wonderful fat people close to you. I’M FAT. YOU’RE FAT. LET’S PARTY. Although I wear guys small, I love that this tee’s message isn’t necessarily about physical size. Instead, it’s about the digging deeper to express our love for delicious foods like chips, cookies, and all kinds of tasty treats. 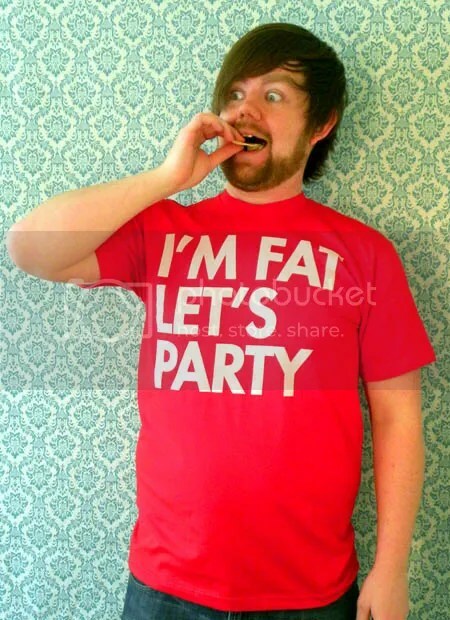 I’m definitely a fatty at heart, so let’s party! 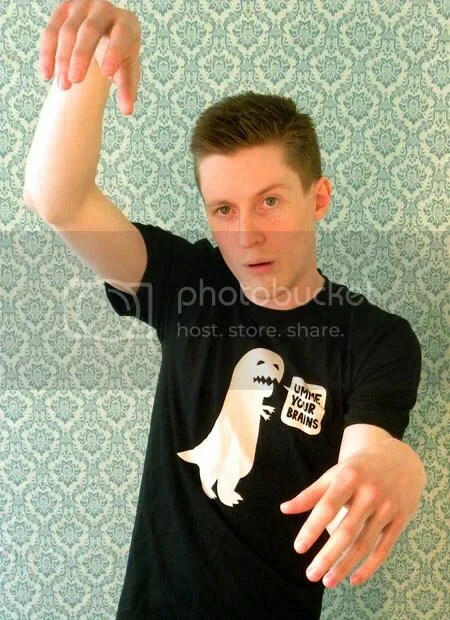 At SEIBEI, you will also find a great new colorway of the classic Sandwich Dinosaur tee along with a new Zombie Edition. GIMME YOUR BRAINS!! Love it. Head over to SEIBEI to pick up some fun new tees today and save 10% by using the coupon code “LTT” at checkout. Ever since it went up for voting, I have been waiting to see “Battle of Hiroshima!” by Fallen sold on Teextile. I haven’t seen colors like this before on a tee from this site, so it’s great to finally see a fun-colored tees being printed. The design shows an epic battle that is about to take place. Who will be the crowning victor, the fully automated super machine or the fire-breathing dinosaur? Place your bets now and watch the fight unfold. You might just get to see the robot powerslam his enemy in this city rink! You can get this tee for $15 all this week and on Wednesday for a reduced price of $12. If you voted for this design, you will get free shipping too!